If I could create a tagline for this book, it would be simple: ‘All the Bright Places broke my heart. 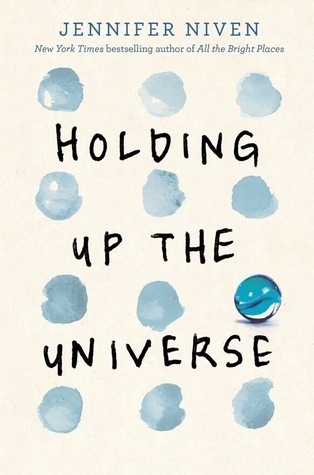 Holding Up the Universe put it back together’. I’m sure any fans of Jennifer will have had their heart broken by her, just like I did. But even though she broke my heart, All the Bright Places is one of my absolute favourite books in YA! Even heartbreaking books can be beautiful. But I’m still very happy to say that this time, Jennifer Niven kept my heart in tact – but still created an absolutely incredible novel I shed tears at! Now before I go on, please know that this is going to be a half-rant, and totally savage. No, not at the book. At those that appear to hate it. Okay, so for one..people need to stop hating on this novel without knowing the full facts! Yeah, books aren’t for everyone. Nothing is! But people saying Jennifer Niven “didn’t do her research” and all of the mental illness stuff is just “window dressing” (*rolls eyes*) can honestly go f*** themselves. I personally know (from having MET AND SPOKE TO HER), that Jennifer did so much background research (including talking to sufferers, doctors, family, friends and professionals about what Libby and Jack are going through (oh, and having it edited by someone with Jack’s condition!)) for this novel that there is absolutely no possibility that could be window dressing. It’s what defines the characters for who they really are. It’s their thoughts and feelings. It’s what shapes them as not just a character, but a real person. I have suffered from so much anxiety throughout my life that I know how well Jennifer Niven portrayed it in this novel. I know how it feels to not feel like you’re wanted or loved or necessary…what an amazing thing it is that someone came out with a novel to challenge that. How f***ing awesome. How can people not like a novel that is basically one big metaphor for the fact that every single person is wanted and needed? How can someone not like the fact that a fat girl had the guts to stand in a purple bikini and show everyone how epic she is? Sure, it’s a high school romance, but there is no way I’m going to admit it’s cliche. If something is cliche, I’d say I knew everything that was going to happen in the book (*cough* An Abundance of Katherine’s *cough*). But no, I was on the edge of my seat the whole time. This isn’t just any popular-guy-meets-antisocial-girl novel. This isn’t just any novel. This novel is a giant middle finger to bullies. This is exactly what the world needs more of. If everyone was a Jennifer Niven, the world would be a much better place. LIBBY. YOU ARE AWESOME! The two main characters in this book were amazing because they learned to not be ashamed of who they are (among many more things like dancing and We Have Always Lived in the Castle and writing on shoes and standing up for what you believe in etc). Can I have a purple bikini too? This book was relatable. To anyone who has suffered from feeling left out (which I’m sure we all have), this book is totally relatable. It doesn’t matter if you’re a size 0 and reading about a fat (ugh, how I hate the term ‘fat’) girl. It doesn’t matter that Jack has a rare condition not many readers will have. It’s still relatable. This seems like a pathetic thing to say after all the other massive rant-y style things I’ve said, but it’s a really easy read. The pages just flew by! READ THE ACKNOWLEDGMENTS. They made me cry! I don’t think I need to say ‘I give this book 5 stars’, because it’s obvious I think of it as much higher than that, worth so much more. But for the sake of Goodreads, I rate this book 5 massive stars. Oh, and if anyone thinks I’m wrong and wants to argue about this? I’m prepared to fight. Come at me. T5W: Books I Want To Reread!